NOTE: Knife is not included. 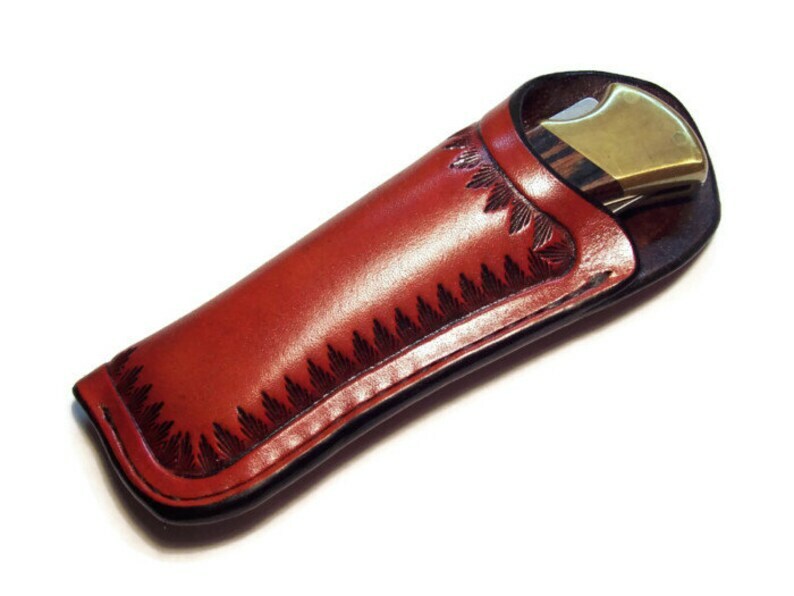 This is a custom designed leather knife sheath without belt loop specifically designed to fit a Buck 110 knife, Case Sod Buster knife, or like knives. Will fit knives that measure up to 5" long x 1 1/4" wide x 5/8" thick. Features heavy premium carving leather construction, hand tooled grass border design, recessed hand stitching, and hand rubbed finished edges. Available in Black, Mahogany, Saddle Tan (shown), Chocolate Brown (shown), Natural Leather with natural edges, and or Natural Leather with black edges. A color chart can be found by scrolling through the photo's. This item is being made as ordered at this time and ships in approx. 2 weeks unless in stock. Stitching is guaranteed for the life of the item. Built to last ! Quality made in the USA !